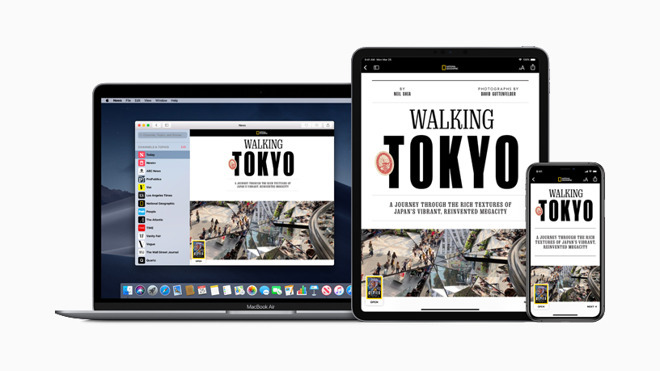 Discussions of crashing within seconds of content display on the Apple News app started circulating on social media early Tuesday morning, with one AppleInsider staffer seeing the problem on one device —but not all of them. The app launches on either macOS or iOS, may briefly display content, then crashes back to the screen that the app was opened. Many users reporting problems on Tuesday morning had previously used social media to comment that the service was working perfectly after launch. There does not appear to be any commonality between devices that manifest the crash, it wasn't limited to devices that ran an iOS 12.2 or macOS beta, nor is it iCloud account-wide. At present, a fresh install of iOS 12.2 or macOS 10.14.4 doesn't seem to fix the problem for all users either. Brief testing on our affected device has demonstrated that a device hard reboot has some impact on the app —but isn't a guaranteed long-term fix. After one reboot, the app stayed open for about 8 seconds, before crash. Following a second reboot, the app appears to be still functioning. Update 10:26 a.m. eastern time: Apple has rolled out fixes across the board, and the app on both iOS and macOS appears to be functioning again as intended. No commentary regarding the cause of the issues has been made by the company. Apple News+, previously rumored to be called "Apple News Magazines", costs $9.99 per month in the US ($12.99 in Canada) and ships with the entire catalog that it has been hosting after the Texture purchase. In a similar way to how it introduces Apple Music, Apple is offering a free trial of Apple News+ for one month. Notable magazines available at launch include The Atlantic, Better Homes & Gardens, Conde Nast Traveller, Esquire and Vanity Fair. Alongside print magazines and newspapers, the service will also contain online-only titles such as theSkimm, New York Magazine's Vulture, and The Highlight by Vox. Apple CEO Tim Cook said at the "Its show time" event on Monday that over 5 billion stories have been read on Apple News, making it the number one news app ever created.